In school books, we have all studied programmed cell death (PCD), cell proliferation and tissue growth definition. Have we ever thought that these process are interlinked? Sounds insane right!!! I am also like you, bewildered after reading this finding. Herewith I am providing insight to those processes that were recently understood. Two independent experiments done by Steller and Morata groups have revealed interplay between cell death and neighboring cells' migration and cell growth. Cells which are undergoing apoptosis, transiently express signal molecules, which makes the neighboring cells to enter cell cycle and initiating process tissue regrowth. They have conducted these experiments in model organism, Drosophila melanogaster. The curiosity which wanted them to understand that in many metazoans, cells that were marked as "odd man of the group" were quickly removed through PCD. Researchers had observed this in Drosophila very well, that there was always a compensation and that made cell count to remain more or less same. Even it was well known fact, the reason behind the induction extra cell proliferation was poorly understood. To understand state of the apoptotic cells in a tissue, researchers came with an idea of not allowing the cells which are "doomed to die". They achieved it, by overexpressing the anti-apoptotic factor p35 (activator of cyclin dependent kinase 5). It would activate bcl-2, which plays key role in inhibiting apoptosis. By prolonging the cells life that are "doomed die", allows the researchers to identify the mitogens which are expressed by the cells, otherwise apoptotic cells will be rapidly cleared off from the site and that makes difficult to understand the mechanism. The resulting cells, expressed mitogens (that are produced during embryogenesis and fetal development) and further led to tissue overgrowth. The mitogens are Decapentaplegic (dpp) and wingless in flies. They further activate WNT signalling pathway. These molecules acts on wnt/b-catenin which further cascades the pathway on cell cycle regulation. Detailed steps involved in the pathway is depicted in Fig 1. This was, further confirmed by impaired WNT signalling in cells resulted in no proliferation or overgrowth of tissue near the apoptotic cells. To counteract this finding, it's obvious for us to have a question that p35 overexpression could have led to wg and dpp expression. It's unlikely happen, since p35 doesn't affect anything in normal developmental apoptotic cells or otherwise non-stressed apoptotic cells. Hence, researchers believe that wg and dpp expression is normal behavior of apoptotic cells. Only trouble is these apoptotic cells are rapidly cleared off from the tissue, making the signalling transient and difficult to identify. To overcome this situation, researchers developed a model with a genotype wg-gal4>UAS-lacZ larvae. When there is wg expression in cells, higher amount stable Beta-galactosidase protein would be expressed, which could be easily measured. Fig 1: Pathway involved in compensation proliferation. One more important question which stands between this hypothesis is that why this compensational proliferation doesn't happen in normal developmental apoptosis? 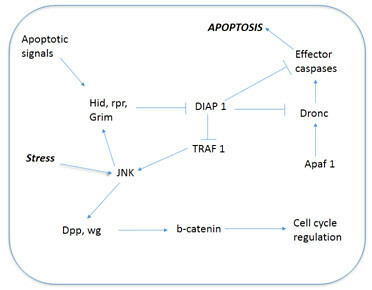 A speculation is that during cell injury, along with the stress induced by cells and apoptosis would lead to compensational proliferation by activation of JNK signalling pathway. Stress which is absent in normal developmental apoptosis doesn't activate JNK signalling and therefore neighboring cells "don't get signals" for compensation proliferation. Another finding from these experiments is that prolonging the "cell life" by inhibiting cell death leads to the continuous expression of wingless (wg), dpp. This leads to uncontrolled proliferation of cells nearby those cells. Pathology of overgrown tissue looks like tumorous mass in vertebrates, also showing the hallmarks of cancer like aberrated cell shape, size and invasiveness. This could be because of inhibition of final step "cell death" in apoptotic agenda. Its well-known fact that apoptosis inhibition seems to associate with cells invasiveness and tumorigenicity. During experimental procedure, caspase activity was suppressed and in turn leads to abnormal growth. This could be one of the mechanism by which certain virus causes cancer in vertebrates. Another fact is that JNK signalling helps cells mobility and its one of hallmark of cancerous cells. This revealing makes strengthens our understanding of cancer biology. Meanwhile, some research groups feels along with wg and dpp, other factors should be released from the apoptotic cells. Also, cells are attached together through extra cellular matrix (ECM). Sudden death of many cells leaves the area vacant and wither off the attachment in ECM leaves the mechanical signal which maintains homeostasis. We know the importance of apoptosis and cells growth in maintaining homeostasis in us. Nevertheless, direct interplay between them is quite surprising and unique. These findings are preliminary, there needs to be further experiments to strongly suggest the interplay between apoptosis and cell growth. We, as researchers have to take steps, to test this hypothesis in higher animal models like in mice, rats etc. Even it holds good for the tumorigenicity findings. Let's all put an 'extra' effort to ascertain these findings to help further generation. They could help us in designing appropriate strategy in tissue regeneration. 1. Ryoo HD, Gorenc T, Steller H. Apoptotic cells can induce compensatory cell proliferation through the JNK and the Wingless signaling pathways. Dev Cell. 2004 Oct;7(4):491-501. 2. Perez-Garijo A, Martin FA, Morata G. Caspase inhibition during apoptosis causes abnormal signalling and developmental aberrations in Drosophila. Development. 2004 Nov; 131(22):5591-8.